Dr. Wechsler's specializes in the treatment of childhood leukemia. Daniel S. Wechsler, MD, PhD, is the director of pediatric oncology at the Aflac Cancer and Blood Disorders Center of Children's Healthcare of Atlanta. 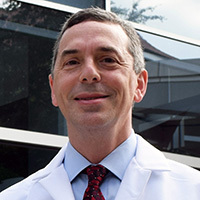 Dr. Wechsler comes to the Aflac Cancer Center having previously served as associate professor of pediatrics, and pharmacology and cell biology at Duke University School of Medicine. A board certified pediatric oncologist, he specializes in the treatment of childhood leukemia. Dr. Wechsler is a member of the Cancer Cell Biology research program at Winship Cancer Institute of Emory University. He also holds professional memberships with American Society of Pediatric Hematology/Oncology, American Society of Hematology and Children's Oncology Group. Dr. Wechsler received his Medical Degree as well as his PhD in Physiology from McGill University in Montreal, Canada. He completed his residency in pediatrics and a fellowship in pediatric hematology/oncology at The Johns Hopkins Hospital in Baltimore, Maryland. The primary focus of Dr. Wechsler's laboratory is an investigation of the pathogenesis of CALM-AF10 leukemias. They were the first to describe a translocation between MLL and CALM genes in an infant with acute myeloid leukemia, and from this stemmed their interest in understanding the more common CALM-AF10 leukemias. They determined that CALM contains a nuclear export signal (NES) that is critical for its role in leukemogenesis, and furthermore, that the presence of the NES mediated CALM's interaction with CRM1. They found that CRM1 directly associates with HOXA genes, which are critical effectors of leukemogenesis, suggesting that CRM1 may be important for other types of leukemia. The availability of compounds that inhibit CRM1 activity (Selective Inhibitors of Nuclear Export - SINEs) raises the possibility of a novel therapeutic intervention for aggressive CRM1- and HOXAdependent leukemias.